Quite a few of my friends on Facebook seem to be embarking on a meatless diet (or are already practicing vegetarians), but have said (perhaps in not so many words) that ideas are in short supply, that it’s difficult to come up with things that hold their interest for long. 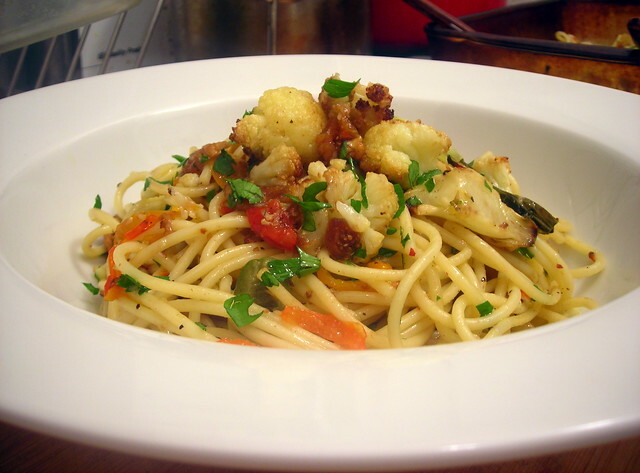 One winter favorite, roasted cauliflower, makes its appearance in an unusual pasta (see below). If you’ve never had roasted cauliflower before, you owe it to yourself to try it as soon as you can. Roasting develops the vegetable’s flavor into a creamy, luscious treat that vaguely tastes like French fries but with a fraction of the calories. By itself, roasted cauliflower is addictive and satisfying. Making a double batch is almost mandatory. This recipe makes enough for 4 servings. 1. If you’d like to make this dish vegan and/or gluten-free, simply substitute pasta made without eggs or gluten-free pasta. 2. These are imported olives from Castelvetrano, Sicily. They may be available at fine food shops or specialty food emporiums in your area. Substitute pitted Kalamata or Niçoise olives if unavailable. 3. Substitute dried currants or golden raisins if unavailable. 4. Available at some delicatessens. They have a sweet-and-sour flavor, and depending on their brine, may have a slight herbal note. Omit if unavailable. Drizzle a little olive oil over the cauliflower. Season to taste with a small pinch of sea salt, and some freshly milled black pepper. Toss the cauliflower a few times to ensure that it’s coated with the oil, salt and pepper. Place the roasting pan in the oven, then roast at 350 F for 35 to 40 minutes or until the cauliflower is golden brown. Prepare pasta according to package directions. Ideally, you should begin this step when you’re halfway through roasting the cauliflower. Cook the spaghetti until the pasta is al dente, then drain. Reserve about 1/4 cup pasta cooking water. Remove the cauliflower from the oven. Add the cooked pasta, olives, figs and pickled cherry peppers directly to the cauliflower. Mix well. If the pasta seems too dry, add some pasta cooking water to the roasting pan or until the pasta is sufficiently moistened to your liking. You shouldn’t need to do this too much however, as the pan juices from the roasted cauliflower should be enough to form a light sauce. Taste for salt and pepper, drizzle a little extra-virgin olive oil (if desired), sprinkle some Italian parsley, then serve immediately. Time: About one hour, including prep. The vast majority of that will be spent roasting the cauliflower. 1. Substitute currants or golden raisins if dried figs are unavailable. Heat oven to 375 F degrees. Using a large rimmed baking sheet, toss leeks with 2 tablespoons olive oil. Season to taste with salt and pepper. Spread leeks out in a single layer (use a second baking sheet if necessary) and roast, tossing frequently, until golden brown and crisp at the edges, about 20 minutes. 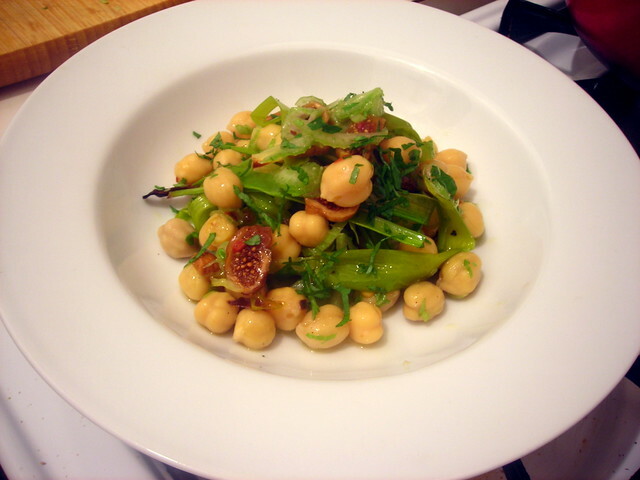 In a large bowl, combine chickpeas, lemon juice, chile flakes, and salt and pepper to taste. Mix well. Stir in 1/4 cup olive oil. Let the chickpeas marinate while the leeks roast. When the leeks are done, add to the chickpea mixture. Stir in the celery, celery leaves and figs. Toss once or twice. Adjust seasoning (add more salt, pepper or lemon if needed), then serve immediately. 1. These are heirloom fingerling potatoes. May be available at some farmer’s markets in your area. Substitute Yukon Gold potatoes if unavailable. 2. These are the leaves and thick green “ribs” from a head of cauliflower. Most people tend to throw them into the garbage. I think that’s a shame, as they’re delicious in their own right. Toss the carrots with the olive oil and cumin. Season to taste with salt and pepper. You’ll want to go easy on the salt since the carrots’ flavor will become more concentrated once they’re finished cooking. Arrange the carrot slices on a baking sheet. Roast at 400 F for 3-5 minutes, then at 375 F for 3-5 minutes. Let cool on baking sheet, then use as needed. Melt the butter in a large skillet over medium heat. When the butter begins to foam, add the potatoes to the pan along with a scant pinch of salt. Fry the potatoes until they begin to turn golden brown, stirring frequently. At this point, add the cauliflower greens to the pan. Cook until the potatoes are completely golden, and the greens are a bright shade of green, about 3-4 minutes. Taste for salt and pepper; stir in some chopped parsley. While the potatoes are cooking, bring a pot of water to a bare simmer and slip the egg into the water. Lift out with a slotted spoon when egg is done, about 2-3 minutes. Spoon potatoes and cauliflower greens on a serving plate. 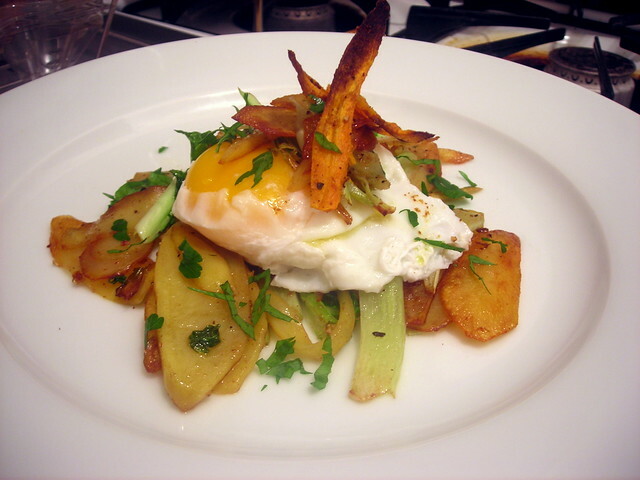 Top with the poached egg. Top the egg with the carrot “chips”. Serve at once. As written, this recipe makes enough for 1 serving. This is barely a recipe. Begin with 1 cup of brown basmati rice and slightly over 2 cups of water, dashi or vegetable stock in a small pot. I used leftover lentil cooking liquid from this post, a pinch of sea salt and a pinch of white pepper. Bring this mixture to a boil, then lower the heat to low. Cover and cook for 25 to 30 minutes, or until the rice is done. Turn off the heat and let stand for 5 minutes, then fluff the rice with a fork. Meanwhile, cut some silken tofu into cubes. Mince some scallions if you like. Have at the ready some sesame oil, tamari (optional) and black pepper. When the rice is done, spoon into a bowl. 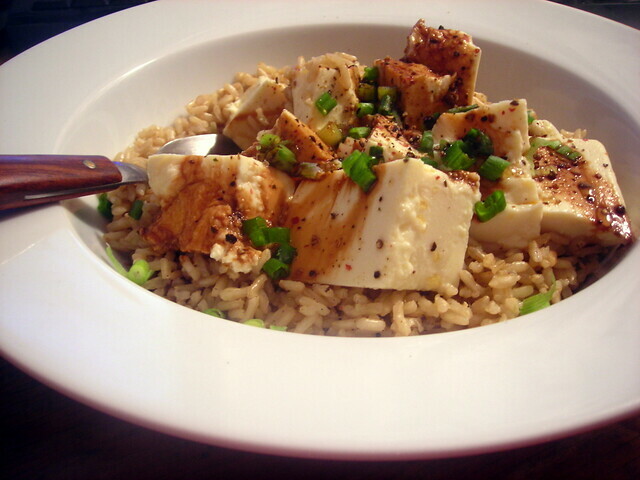 Top with the tofu and scallions; season to taste with sesame oil, tamari (if desired) and black pepper. Serve immediately. Time: Takes about 40 minutes, including prep. 21 Jan	This entry was published on January 21, 2013 at 8:21 pm. It’s filed under American cuisine, Chinese food, cooking, food, food photography, Gluten-Free, Italian food, recipe, vegan, vegetarian, winter and tagged appetizer, brunch, dinner, food photography, gluten-free, salad, vegan, vegetarian, winter. Bookmark the permalink. Follow any comments here with the RSS feed for this post.